We can repair or service any make or model air conditioning system. During the summer months in La Crosse area, it’s important to have a reliable air conditioner to keep your home cool and comfortable. Trane air conditioners are durable and reliable. Today’s air conditioners provide more comfort and are more efficient than ever; and that’s easy on your electric bill. No matter the size of your home, there’s a Trane air conditioner to help keep it cool. 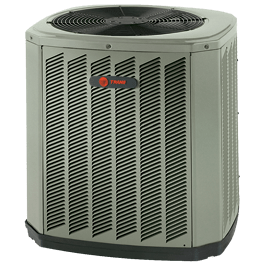 As the La Crosse Area’s only Trane Comfort Specialist, you can trust Bagniefski Heating and Air Conditioning to provide you with quality installation of your new Trane air conditioner or to provide you with exceptional customer service and support when you need it. HVAC maintenance is necessary to keep your HVAC system running efficiently, maintain high indoor air quality, prolong the life of your equipment, and reduce the need for expensive repairs. We will inspect and clean your A/C or Central Air Unit. All makes and models can be serviced. *All prices are within local service area.